Dortmund - A makeshift Borussia Dortmund side saw off the challenge of a spirited FC Augsburg outfit to take the points in a highly entertaining 4-2 victory. put the hosts in front early on, but two goals in as many minutes just before half time from and Kevin Vogt saw Augsburg turn the game on its head. 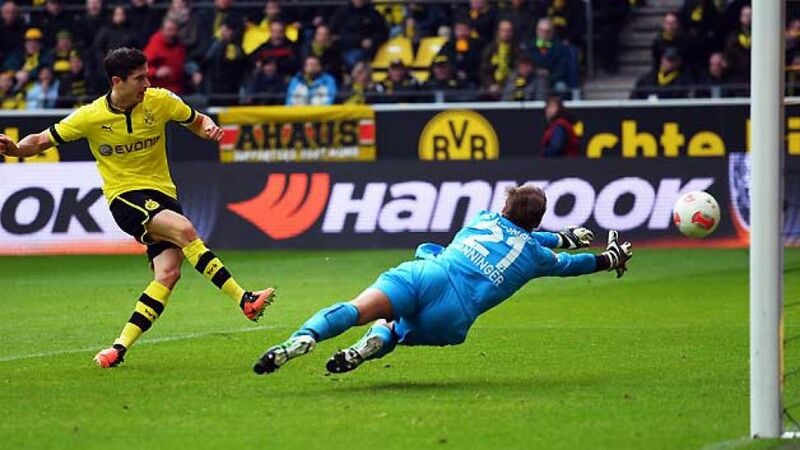 Schieber’s second of the match brought Dortmund level again before put Dortmund back in front. There was still time for to continue his remarkable scoring streak with a fourth. With Tuesday's UEFA Champions League quarter-final return leg against Malaga CF in mind, Dortmund coach Jürgen Klopp made wholesale changes to the team which eked out a 0-0 draw in Spain. Despite the mass rotation, the Yellow-Blacks' flow did not seem disrupted. Schieber had been on the winning side in each of his previous five Bundesliga starts for BVB and it looked like it would be no exception as he put the hosts ahead with his second league goal of the season. Jan-Inger Callsen-Bracker should probably have done better to deny him, but the striker avoided him to net past the lunge of Paul Verhaegh. With pulling the strings in the middle, Dortmund were keen to exert their superiority on the game and the Turkey international went close to making it 2-0 with a shot which did well to save. The Austrian goalkeeper was back in the Augsburg goal for the first time in six matches, eager to defend his record of only one defeat in five appearances, and he kept his side in the game with another solid save from a effort. As Dortmund were preparing for their half-time cup of tea, a bolt out of the blue silenced the . Schieber’s headed clearance from a corner fell to Baier, who showed terrific technique to volley home from nearly 25 yards. Dortmund were still coming to terms with the shock of conceding when Vogt put the Bavarians in front just before the half-time whistle, pouncing on the loose ball to score after could only parry ’s effort. Klopp responded early in the second half by sending on Lewandowski and Mario Götze. Within a minute, the ball was in the back of the net. Jonas Hofmann, starting his first BVB game after appearing for just a minute previously, unselfishly squared for Schieber to stroke the ball into the goal for his first ever brace as a Dortmund player. It was the spark which ignited Dortmund again, and they soon took the lead for the second time, with Subotic beating stand-in captain to the ball to score from a yard out after ’s free-kick found its way through a group of players inside the Augsburg penalty area. Lewandowski scored for the 10th game in a row to put the result beyond all doubt, but it was not enough to prevent them relinquishing their Bundesliga title to FC Bayern Munich, who beat Eintracht Frankfurt.